1.Tweezers: Often times our tweezers will get dull, making it hard to pluck those small hairs. By using a nail file or sandpaper to sharpen your tweezers, the edges will be as good as new. 2. Lotion/Hairspray Spouts: Those little crusty edges can be simply peeled or rubbed off by taking a spare makeup wipe and cleaning out the spout. By doing this, more product will be able to come out which makes it easer to use, plus you won’t be wasting any product. 3. Eyelash Curler: Take a makeup wipe to remove any extra product from your mascara that was left behind on the curler. The rubber pads should also be replaced to ensure the tool can curl your lashes perfectly. 4. 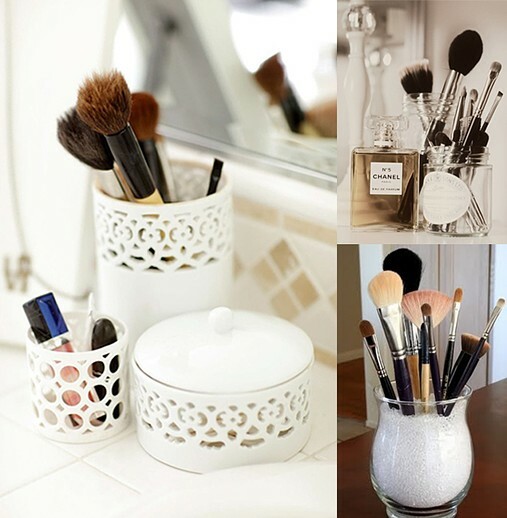 Makeup Brushes: Though you should be spot cleaning these with a brush cleanser once a week, cleaning brushes thoroughly should happen about every month. Take baby shampoo or mild soap and deeply wash them with warm water and lay them flat on a towel to dry, as to not warp the shape of the brush. This will rid any sign of left behind makeup, meaning you won’t be spreading old makeup onto your face. 5. Makeup Containers: Between powders cracking and creams spilling, the containers you use to store your makeup can tend to get dirty over time. Take all of your makeup out and clean the bins themselves, then line with a silverware lining to make sure everything will remain clean. 6. Nail Care: Much like the mascara rule, nail files need to be replaced about every three months. Soak any other nail tools (like clippers or cuticle scissors) in an anti-bacterial soap solution for about 15 minutes then rinse with warm water and let dry. 7. Hair Brushes: Use a wide toothed-comb to go through your brush, pulling out all of the hair trapped in the bristles, then shampoo your brush and let it dry upside down on a towel. 8. Pencil Sharpener: To keep the blade sharp, unscrew the razor inside and sharpen with a knife sharpener. 9. Hair Dryer: After unplugging, take a dry toothbrush and run it over the vent on the back. Depending on your type of hair dryer, you may need to take off a piece to get to the vent, but after cleaning it out and reassembling it will work like new. 10. Curlers And Straighteners: To get rid of the black build up on your styling tool, wipe the plates with alcohol, baking soda, or acetone while unplugged. Don’t scrub to harshly though, it will effect the finish of the tool.